While most people say that breakfast is the most important meal of the day it is ironically the meal that gets skipped most often. You don’t need to get up an hour earlier each day to make time for breakfast, with a little bit of planning and bulk cooking you can not only survive the morning rush but ease your way into an energetic start to the day. If I am not hungry in the morning do I need to eat breakfast? The simple answer is yes (assuming you want to look and feel your best). In a best-case scenario, aim to eat your breakfast within about an hour or so of waking up. If you have been a breakfast skipper your entire life then start with a bite sized change. Aim to begin having breakfast at the first available time you can wrap your head around eating something that doesn’t make you feel nauseated. I am willing to bet that you can find a window before lunch that could work for you. Why is skipping breakfast bad? Breakfast means “break the fast.” You need food to help your body burn energy efficiently throughout the day. Breakfast is essential to maximize productivity, energy and a healthy weight. If you can’t stop munching all evening, the first question you should ask yourself is, “Did I have a balanced breakfast?” If you skip breakfast and try to rely on willpower to control overeating in the evening, you will likely fail. From a psychological standpoint, if you skip breakfast you may also be justifying overeating in the evening. This “starve early, binge later” mindset does not help you manage a healthy weight and can create an unhealthy relationship with food. What does a balanced breakfast look like? Your brain needs carbohydrates for thinking, concentrating and elevating your energy. Your muscles also use carbohydrates as “gasoline” to fuel working muscles. Protein-rich foods are also important to help sustain fullness and provide longer lasting energy and productivity. Grains/starches such as whole-grain toast, pancakes, high-fibre breakfast cereal, oatmeal or leftover pasta, rice or other grains from supper. Fruits/vegetables such as fresh fruit, canned unsweetened fruit, dried fruit, frozen fruit or even raw or cooked veggies if you prefer. A source of protein, such as eggs, nuts, nut butter, cheese, cottage cheese, yogurt, milk, soy milk, protein powder, tofu, meat, poultry or seafood. What are some make and take breakfast ideas? On the weekend make a giant big batch of waffles and refrigerate or freeze during the week. Reheat in the toaster and top with peanut butter (or your favorite nut butter) and jam or honey. Pack a fresh fruit to go. Peel or slice an orange or grapefruit for easy eating on the go. 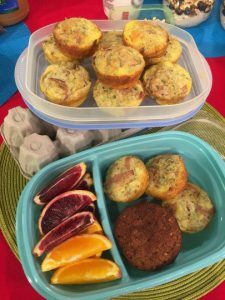 Or try muffin tin eggs are easy to make ahead at night or on the weekend: Stir together 6 beaten eggs, 1/2 cup grated cheese, 1.5 cups diced ham (optional), 3 tbsp chopped chives and 1/2 cup breadcrumbs. Spoon into greased muffin tins and bake at 375F for 15-20 minutes. Enjoy hot or cold. 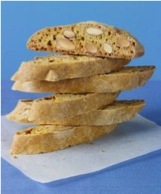 Pack fresh fruit or a handful of dried fruit such as figs, apricots or dates. 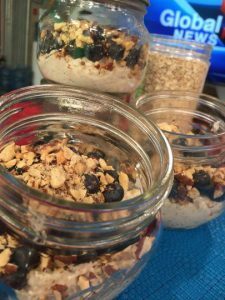 In a medium mason jar combine 1/3 cup quick oats, 3 tbsp. seeds (chia seeds, ground flax seeds or hemp hearts), 1/2 cup plain kefir or yogurt and a drizzle of maple syrup or honey. Top the jar with 1/2 cup fresh or frozen berries. Prepare a few jars at once to save time. 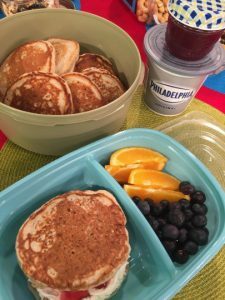 Have a “backwards day” and make pancakes for supper tonight so you will have extras to freeze or refrigerate for upcoming breakfasts. Make your favorite pancake recipe but try stirring in hemp hearts to boost the protein content of your pancake (since 3 tablespoons contains 10 grams of protein). Spread cream cheese and jam in between two pancakes and create a sandwich. Try a citrus parfait with oranges and chopped almonds or a tropical parfait with mango, pineapple and coconut. 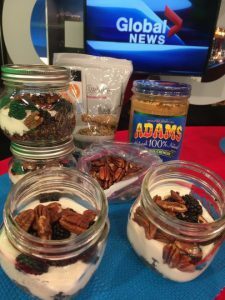 If breakfast is often hit and miss for you assemble what I call the “all-in-one crunch mix” that you can grab on the go or keep stashed in your car, bag or desk at all times. 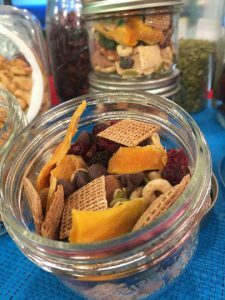 To make an all-in-one crunch mix: line up a bunch of your plastic containers or small mason jars on the counter and fill them with a mix of dried fruit (such as raisins, dried cranberries, dried figs, dates, prunes, dried apricots), nuts or seeds (such as almonds, pecans, walnuts, cashews, peanuts, pumpkin seeds or sunflower seeds), long strands of coconut and a mix of ready-to-eat breakfast cereal or small crackers. 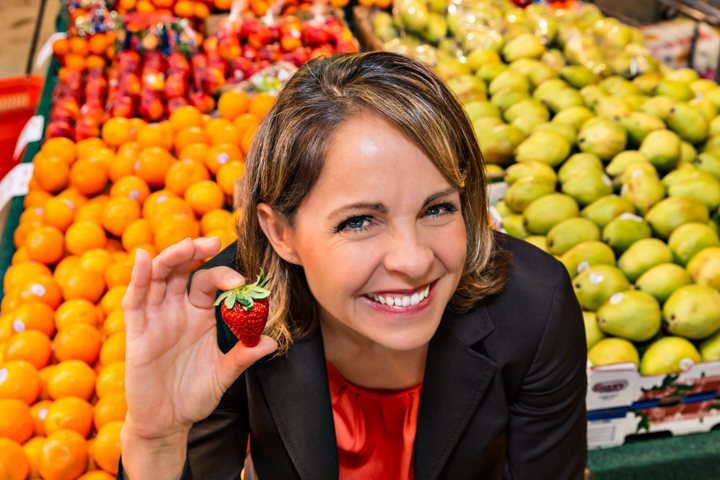 Sign up for Andrea’s upcoming online nutrition course, or our bi-weekly newsletter, Sound Bites, for more ideas and suggestions for great breakfast (and lunch, and supper, and beyond!) ideas. 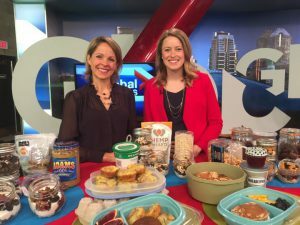 Great breakfast meal prep tips, thanks!